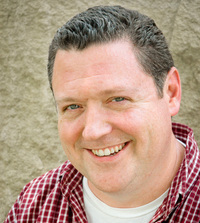 John Cosper is an award-winning writer from Southern Indiana and the founder of Righteous Insanity. He has written more than 2000 sketches and produced over 100 short films. He is the author of several science fiction novels, short story collections, and even kids stories. John's film credits include the Fluffy trilogy, the Clive the Zombie puppet films, The Hauss Show, and award-winning short films Out of My Mind, The Telemarketer, Tolerance, and Bots. He's dabbled in noir, horror, and other dark realms, but for the most part he prefers humor and space opera to dystopian societies filled with moody teenagers. Never one to stay stuck in one genre for long, John also writes about professional wrestling. He is the author of several wrestling hi John Cosper is an award-winning writer from Southern Indiana and the founder of Righteous Insanity. He has written more than 2000 sketches and produced over 100 short films. He is the author of several science fiction novels, short story collections, and even kids stories. Never one to stay stuck in one genre for long, John also writes about professional wrestling. He is the author of several wrestling histories and biographies, and he writes about wrestling's past and present on his blog www.eatsleepwrestle.com. To ask John Cosper questions, please sign up. Zorana - Now on Amazon! One of my older stories, Demonica, has been reborn! John said: " This book came along at a time when I needed it. It helped me let go of a very angry, bitter attitude and become a kinder, more loving person. Sounds cliche and corny, but I don't really care. It's the example Mr. Rogers set for us, and it's a great This book came along at a time when I needed it. It helped me let go of a very angry, bitter attitude and become a kinder, more loving person. Sounds cliche and corny, but I don't really care. It's the example Mr. Rogers set for us, and it's a great way to be. ...more "
We’d love your help. Let us know what’s wrong with this preview of A Hobbit, a Wardrobe, and a Great War by Joseph Loconte. We’d love your help. Let us know what’s wrong with this preview of The Simple Faith of Mister Rogers by Amy Hollingsworth. We’d love your help. Let us know what’s wrong with this preview of Groucho and Me by Groucho Marx. We’d love your help. Let us know what’s wrong with this preview of A Wrestling Life by Dan Gable. We’d love your help. Let us know what’s wrong with this preview of A Wrestling Life 2 by Dan Gable. We’d love your help. Let us know what’s wrong with this preview of Ali vs. Inoki by Josh Gross. We’d love your help. Let us know what’s wrong with this preview of Space Drifters by Paul Regnier. Many pro wrestlers have "written" books. This is a place to gather all the wrestling fans together and discuss the books.